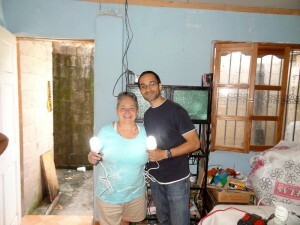 Deborah brought a solar panel kit from the U.S. for her latest trip to Honduras. As luck would have it, Adam Pervez, a modern-day journeyman traveling the world trying to leave each place a bit better than he he found it, was looking for a volunteer opportunity in Honduras. Deborah contacted him as he also happens to be an electrical engineer. 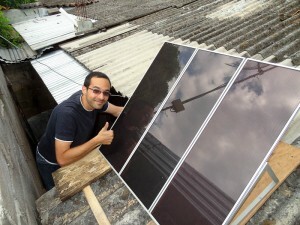 Together, the two designed a platform, affixed the solar panels to the roof of her studio in Copan Ruinas, and harnessed the power of the sun to charge her own car battery. “This is so wonderful,” said Deborah as the supplied lights lit up and the system was proven to work. Deborah plans to continue testing the system another month before handing the setup over to one of the nearby aldeas. 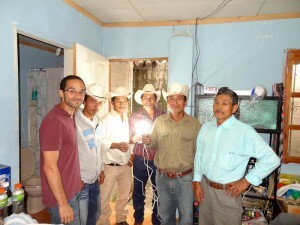 Adam trained the aleada leaders so they will be ready to install the panels on their church in December. They plan to provide cell phones and flashlight charging during the day, and perhaps they’ll offer car battery charging as well to minimize trips up and down the mountain with the heavy batteries on villagers backs. The solar panel kits are part of Deborah’s larger initiative of improving the quality of life for the cooperative members and their families. 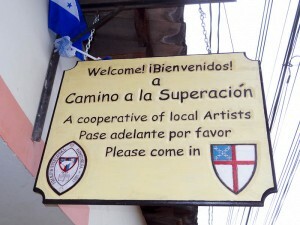 To find out more about her initiative, stop by her studio in Copan Ruinas.